St Thérèse of Lisieux deepened her missionary commitment through her life of contemplative prayer. Most of us are called to live our commitment in the world through witnessing to Christian values in all that we do. But we can call on the intercessions of Thérèse to help us in this task. We do that once agin this year through our Novena in honour of St Thérèse. Through the intercession of St Thérèse, may God continue to bless and protect you. Fr Fachtna O’Driscoll SMA, Provincial Leader, African Missions, Blackrock Road, Cork. If you want to make an offering for our SMA missions please click on line here. 1 October is the Feast of the “Little Flower” another name for St Thérèse of the Child Jesus (1873-1897). 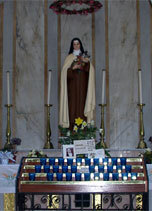 The Little Flower is a favourite saint for many people and she is especially held dear by missionaries everywhere. Her life was short, just 24 years old when she died. She is renowned for the simplicity of her life – she never did anything extraordinary, did not found a religious order, never went on the missions. Her life was a hidden life in the Carmelite convent in Liseaux. But all her yearning was to live in God’s service and everything she did was for love of God, to advance his Kingdom. For all of her short life the work of the missions was special for her. So she has been proclaimed Patroness of the Missions. You are invited to join with us – SMA priests, brothers, seminarians and our supporters throughout Ireland and beyond – in reciting the prayers on each of the nine days of the Novena. And remember: prayer does not change God, it changes us.